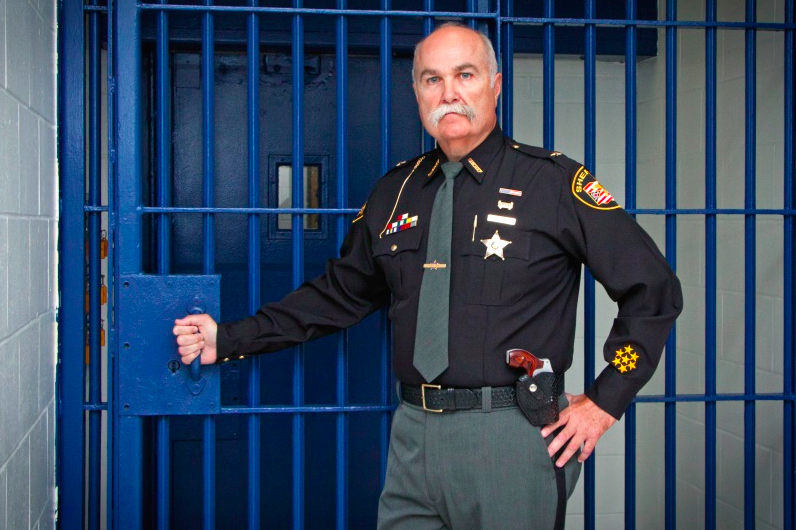 The sheriff of one opioid-ravaged Ohio county is refusing to equip his deputies with Narcan, the drug that has saved the lives of countless overdosing addicts. Butler County Sheriff Richard K. Jones insists he is not heartless but says requiring deputies to administer the remedy puts them in danger and the cost of repeatedly treating people with Narcan is "sucking the taxpayers dry." "All we're doing is reviving them, we're not curing them," Jones told NBC News on Friday. "One person we know has been revived 20 separate times." But, Jones hastened to add, "We don't go there and let people die." "Here in Ohio, the live squads (paramedics) get in there about the same time and they're more equipped to use Narcan," he said. "The people who use drugs don't usually like the police and they turn violent once they're revived." "Some police departments that use Narcan won't even allow police to use it unless there's two officers on the scene," he added. "The police feel unsafe using this Narcan because they have to get down on their knees, squirt it into their nose, and the people they are saving are not happy to see them. They're angry as hell." Jones conceded that he is not in step with the sheriffs of neighboring counties who equip their deputies with Narcan, one dose of which costs $37.50 for first responders. He says he doesn't care. "There's no law that say police officers have to carry Narcan," he said. "Until there is, we're not going to use it." The sheriff spoke out a week after City Councilman Dan Picard in nearby Middletown, Ohio touched off a firestorm of outrage when he asked his town's legal department to look into whether they are legally required to dispatch ambulances to rescue drug addicts who repeatedly overdose. And just as it does for Jones, the bottom line for taxpayers figured into Picard's reasoning. Asked when Picard's query is likely to come before the city council for discussion, Middletown city manager Doug Adkins responded in an email, "No idea whatsoever." Adkins also said Middletown police officers don't carry Narcan. "Middletown is a small enough city that our paramedics are usually on the scene ahead of or simultaneously with police," he added. "We let the medical professionals handle administration of Narcan. We have never run out of Narcan, and have no intention of allowing that to happen." As for the sheriff, Adkins wrote they have "a great working relationship with the Butler County Sheriff's office and we understand Sheriff Jones' concerns." If Jones decided to equip his deputies with Narcan, whose generic name is naloxone, Butler County wouldn't be shouldering the financial burden alone, a spokesman for the state Department of Mental Health and Addiction Services said. "Local law enforcement in Ohio can decide whether to carry naloxone, and many are choosing to do so," the spokesman said. "The state helps fund the purchase of naloxone for first responders — including law enforcement. "Ohio is one of several Rust Belt states that has been hit especially hard by the opioid epidemic raging across the nation. And Butler County, which has a population of 368,100, recorded 210 fatal drug overdose deaths last year, according to the state Department of Health. To combat the scourge, Gov. John Kasich signed an order that would limit opioid prescription painkillers — which experts say have led many drug abusers to heroin — to no more than seven days for adults. And the state's attorney general, Mike DeWine, has filed a lawsuit against five of the biggest prescription painkiller manufacturers accusing them of getting Ohioans hooked on opioids. Jones, who readily admits he is a "controversial person," said he does not have a solution to the drug crisis. "I just know what we are doing is not working," he said. "My brother died of cirrhosis of the liver and early in his life he had a drug problem. There isn't somebody out there who doesn't know somebody who has a drug issue. I am trying to get the point across that we're just frustrated." The debate over whether Narcan should be given to people who repeatedly overdose is likely to be addressed at the upcoming "America's Opioid Crisis: A National Town Hall" on July 12 at George Washington University in the nation's capital. "Naloxone — the opioid overdose reversal medication — is saving many lives, thankfully," Nick Motu, vice president of the Hazelden Betty Ford Institute for Recovery Advocacy said in a statement. "But sadly, even after surviving near-death overdoses, many will return to using, some will overdose again and too many will be lost."